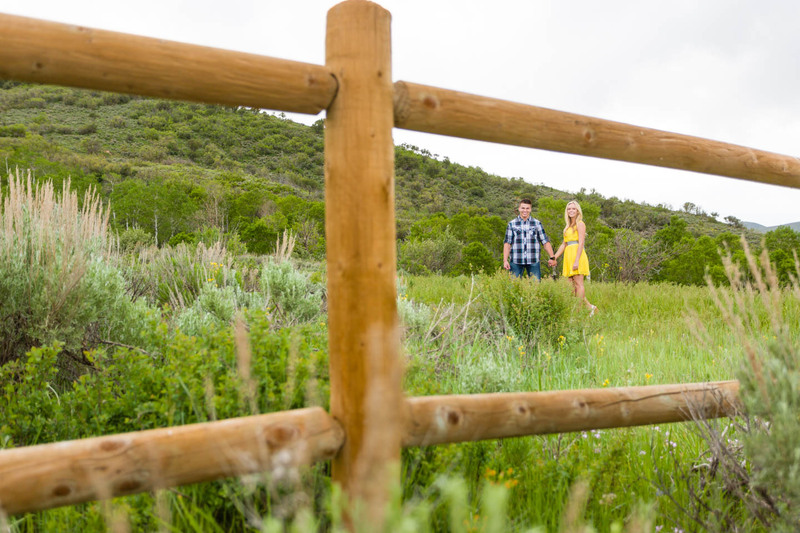 I found a wonderful location in Park City for photography! It is on the way to the Olympic Park right after the outlet stores. The location has a ton of aspen trees and some wooden fence for backgrounds. It is a bike trail so as long as you watch for cyclists everyone should be fine. C.J. and Red will be married at the end of August and I can’t wait to photograph their wedding. C.J. has been a model and that is always a bonus for a photographer. When picking a location for engagement photography I like to find out what the couple likes. Nature was top on their list so this location was perfect. I did do a bit of scouting for a location this time. I was up Millcreek Canyon, Neff Canyon, and even Big Cottonwood and Little Cottonwood Canyon. Park City can be a bit of a drive for some people but it was worth it. I sent C.J. some sample photos of this particular location and she loved it. And this was one of those times I hired an assistant for the shoot. Usually I am able to handle everything myself. But the terrain and the possibility of rain suggested I get an assistant and my friend Pamela stepped up for the challenge. That can be a game changer. I might need an assistant more often—less to worry about. As for the photo shoot I like a mix of posed portraits, candid moments, and everything in between. People sometimes freeze up in front of a camera and I’ll do my best to get you to relax for the lens and be yourselves. Although, we definitely want to encourage some PDA (public display of affection). Holding hands, whispering in the ear, kissing, hugging, and all the smarmy stuff that may usually cause an eye roll are encouraged for the shoot. And most candid moments are pretty much staged. I’ll direct people to walk over here and then move towards or away from the camera holding hands and talking to each other, or maybe steal a kiss or a look at each other. Engagement photos shouldn’t be hard for the photographer or for the couple. And it is a great opportunity to get to know each other. I have shot weddings where I haven’t met the couple until a few hours before the ceremony. Things go a lot smoother when I have met the couple weeks or months in advance during an engagement shoot. They’re a good thing. Lenses and lighting are just the tools. We then need vision and composition. One last note… one thing that sets my photography apart is my lighting style. I almost always bring a strobe light along to create my own lighting and mix that with the available light at whatever location we use. One advantage is almost complete control on how the photograph looks, but I can make my subjects look their best right out of camera. Lighting can fill in shadows in the eyes, fill in lines or wrinkles if they exist, but also give me more creative control. Just something I wanted to mention. An Assortment of Film Photographs. Film is Not Dead, Yet.